Summary: It is America’s worst nightmare: A nuclear bomb destroys a major city. Thousands of Americans are dead and many more will die from radiation poisoning. Threats promising more attacks spread through the media. Panic has broken out in many cities. How could American intelligence have failed to detect a nuclear device? Who is responsible for the blast? Sean Falcone, national security advisor, is tasked with identifying and tracking down the attackers. Powerful forces within the Capital point the finger at Iran. But appearances are always deceiving, and never more so than when millions of innocent people may die for a crime they did not commit. With the potential to incite the entire Muslim world against America and bring the world to the brink of Armageddon, Falcone discovers an astonishing secret hidden deep within the upper echelons of Washington’s elite...but why should the President—or the American people—believe him? 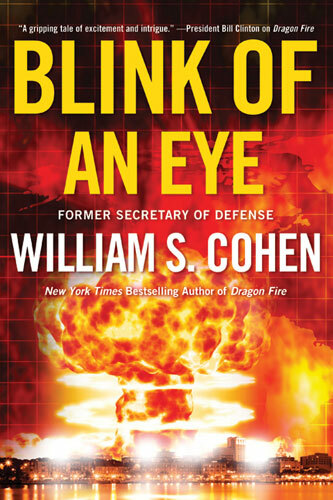 William Cohen, former Secretary of Defense, creates a very plausible scenario in his political thriller, BLINK OF AN EYE. An American city is destroyed by a nuclear explosion and the country must react. The President assigns Sean Falcone, National Security Advisor, the task of tracking down the attackers. Complicating the mission is the fact that the President is in the middle of a re-election campaign and politics become a significant factor in the effort to solve the mystery. Every action must be measured in light of the re-election effort. Many conclude that the blast is an act of terror against the United States. Falcone must avoid a rush to judgment as the President, under a threat of impeachment, is pressured to take military action against Iran. With the assistance of a Washington newspaper reporter and an Israeli spy turned ambassador, Falcone discovers information that could turn Washington upside down if he is to be believed. Although the plot is intriguing, I would not classify BLINK OF AN EYE as an exciting thriller. Most of the action doesn’t occur until the last few chapters of the novel. The strength of this novel is Cohen’s ability to give an insider’s perspective as to how Washington might react to a nuclear crisis. It’s clear that Secretary Cohen knows his way around Washington and his familiarity with the roles that would be assigned to the various departments lends a touch of realism to the novel. However, in focusing on the government’s reaction to the crisis, Cohen complicates the story with too many characters, departments and titles. As a result, although Cohen does an admirable job in defining Sean Falcon’s character, he fails to adequately flesh out many of the other characters. I would recommend BLINK OF AN EYE to anyone interested in a realistic thriller that gives an insider’s perspective on how our government, both politically and administratively, might react to a nuclear crisis. Thanks to Booking Pap Pap for his fine review and to the publisher for providing a copy of this novel. I'd probably read this simply because of the insider's perspective on Washington. That stuff intrigues me. Thanks for another great review. Too many characters can confuse me, but this book might be worth reading for the insider's perspective. Another great review from Booking Pap Pap!